In a quite refreshing tone which was very different from his predecessors, Australian Prime Minister Scott Morrison said that explanations like ‘mental health’ as they’ve often been used in the past were ‘all good and well’ but then went on to describe radical Islamism as Australia's greatest threat in the wake of the Melbourne terrorist attack of last week. Mr Morrison made the comments after Somali terrorist Hassan Khalif Shire Ali, 30 years old, crashed a car filled with gas cylinders on Bourke Street in the city before fatally stabbing Italian-born cafe owner Sisto Malaspina and subsequently being shot dead by police. On Monday morning, Prime Minister Scott Morrison, who took a more rightwing approach to this than any of his fellow party members, clearly said extremist Islam was 'the elephant in the room', adding Mr Shire Ali's reported marriage problems and drug addiction did not negate the fact he was radicalised. “I think that's an excuse. This bloke, radicalised in Australia with extreme Islam, took a knife and cut down a fellow Australian on Bourke Street,” he stated. 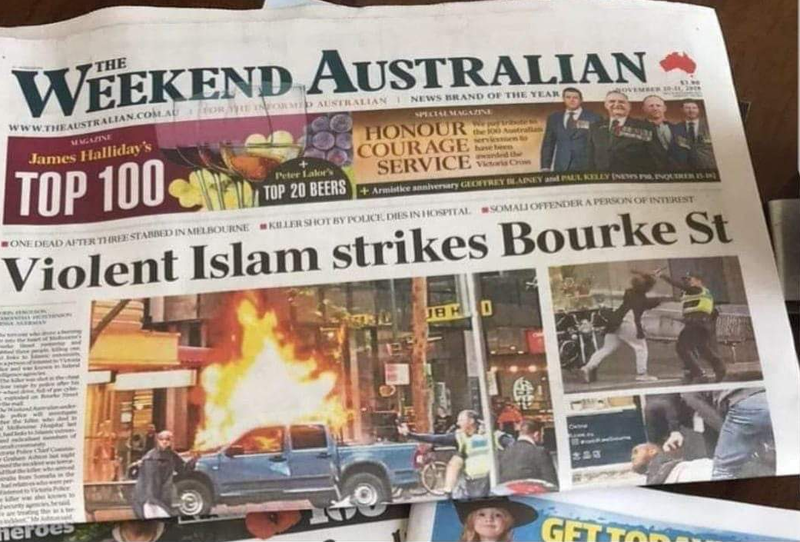 Related coverage: <a href="http://thegoldwater.com/news/41716-Australia-Somali-Born-Terrorist-Behind-Stabbing-Attack-At-Melbourne-Shopping-Mall-Video"> Australia - Somali-Born Terrorist Behind Stabbing Attack At Melbourne Shopping Mall (Video)</a>. Mr Abbott explained that he believes the vast majority of Muslims in Australia were “decent people who have joined our team and have embraced the Australian way of life”. The Oz PM – is his name by any chance Capt. Obvious? If not, it should be changed to reflect his ability in stating it. Sooner, or later, everyone will have to admit that there are NO moderate Muslims and it is certainly not a small fraction of Muslims that feel this way and act this way. If the death penalty is in order, then give them the death they would fear to stop them. It’s a religious war they are engaged in……..give them a hell sending end as examples of resolve to stop their madness. It worked in the Philippines.